Review - Werewolves are an interesting species in that they have pack behaviour, powers that makes sense for what they are and the heightened animalistic aspect of their human existence. And yet it is the human aspect that seems to derail what (in places) is craftily executed in Nightshade. Calla is a strong, capable alpha for a group of her contemporary Keepers. She's take charge and instinctively knows how to handle tough physical situations. However put her into any other kind of dilemma and she's on par with a limp, cotton-stuffed rag doll. While I didn't respond to this, I do see the logic - she's more comfortable in dealing with issues where she can rely on her wolf form, rather than that of a a teen girl. Understandable but not fun for a reader who doesn't respond to lipid. The politics and dynamics of the world Cremer created really drew me into the existence of Keepers. She has obviously worked hard to build a society that pushes and pulls among itself and against the real world. It's fascinating stuff. But when the story begins to involve Shay more and more, I found myself losing more and more interest. Shay doesn't push my buttons. He's not interesting enough to be mysterious and not bland enough to be inconsequential - he floats somewhere in between. He's just not enough. Calla's pull to him wasn't established well enough in any realm other than the physical and this reader didn't buy that as a strong enough reason for her to test the boundaries of her life. Shay's texture comes from external factors - his role, his history and his uncle - not much of it has to do with him. Five minutes in an elevator and I would be terrifically bored. As this is the standard paranormal love triangle scenario there is a guy in the blue corner too. Ren is a complex individual. Well I suspect he's meant to be except that he's not. He's erratic and volatile but in a predictable sense aka if it involves Calla and Shay he's a cliched, jealous, violent beast. And yet I couldn't dislike him for it. I blame Calla....and Cremer. Nightshade lost me because of the characters. The supporting characters are well drawn, rounded individuals that make Cremer's world come alive. Her protagonist and her two beaux throw a wet blanket over it all. The two boys are in love with the protagonist (nothing new) - one she is pledged to, the other one she is drawn to. But...she's emotionally and physically involved with both. And this is where the character lost me - she's apparently is torn just not adverse to toying with their emotions or snogging them. Calla knows who she wants but understands that she's promised to another. Yet she keeps carrying on with both to a degree that I found callous. She's apparently oblivious to the impact of her choices on each of the boys. The denseness of mind was necessary as Calla continues to repeat those behaviours for the majority of the book and made it impossible for this reader to like or empathise with her. Ultimately Nightshade is a compelling world imbued with a less than interesting dilemma involving characters that fail to engage me on an entertainment or emotional level. Part of that is the sheer length of the book, there isn't enough development occurring to warrant its enormous page number. A more definitive, tighter edit would have made most of my criticisms null and void. 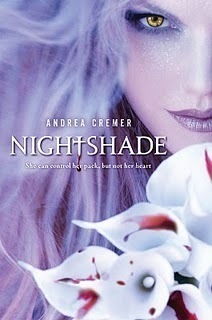 I am excited to read more of Cremer's work, clearly she's a great writer, she needs to direct her focus to creating central characters as unique and as compelling as Calla and Ren's pack members. You have definitely piqued my interest enough to give this one a shot, and i have a perchant for werewolves anyway because the whole pack aspect and inhuman tendencies never fails to draw me in. It does seem that a *lot* of the time, it's either the world or the characters that propell the story forwards, but never both. I used to always want to read a good story and that was what was important to me as a reader. But I'm leaning more towards the characters as of late and I want to understand them, I want to be able to figure out their motives and those of them around them i.e love interests, friends etc. I'm sorry the characters didn't have much of an impact on you, I had the same experience with Firelight. Wonderful Premise, mediocre characters. Fabulous well rounded honest review, as always. reviews like this are the reason i come back again and again and respect your opinion. I thought of Calla's interest towards Shay not as merely physical, but of having to do with the fact that his life is "normal." I felt like Cremer made him deliberately sort of bland, because Calla's one who can't seem to avoid conflict and could use a little bland in her life. Similarly, I did find much of Ren's character to be cliche (like what you mention about his expected reactions, being volatile and angry), but like you said, I couldn't dislike him. I found him rather redeemable, and I felt like this made the love triangle feel a little fresher. Instead of having two awesome boys who continue to be awesome until the girl just decides who's slightly awesomer, or having a "choice" between one boy who is awesome and one who is clearly the wrong choice, this felt grayer to me, which I appreciated. I haven't read this one yet (saving it til closer the UK release), but I am looking forward to it. I don't seem to have a good track record with werewolf books, and I'm hoping this one might prove me wrong. It's interesting what you say about the romance/triangle, as that's what I've heard some reviewers loved the most. Thanks for the insightful review as always. Yours is the first review I've read that talks about anything close to how I feel about this book. And I was really worried it was just me. So thank you for this. Have got to get to this soon. Wonderful and honest review, Adel. This book has been high up on my wishlist for a while now but it doesn't sound like it's bring much new and inventive to this genre so I won't go buying it in the near future. I don't disagree with you, but those elements didn't bother me in the least. I loved the boys and Calla. Sometimes girls are torn over their feelings between two boys and it's not always easy to do the "right" thing. I could easily see why Calla found herself in this position. I thoroughly enjoyed the story, devoured it quickly and can't wait for the sequel. Wow! I'm been lost on your blog for hours, reading reviews and discussion posts! You have wonderful insight, and I'm glad I found you! And yes, there was nothing about Shay that I found exciting in the least, and it disgusted me that Calla played both boys with no regard to the affect she was having on them.